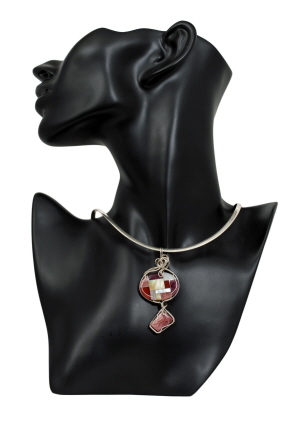 Double the fun and all wrapped up with sterling silver wire into one smart looking pendant! 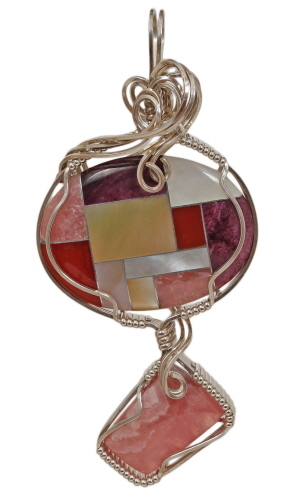 Large cabochon measures 30 mm x 23 mm and is created from inlaid mother-of-pearl, carnelian, rhodonite and rhodochrosite . Small stone of rhodochrosite measures 15 mm x 10 mm. Finished size 70 mm x 32 mm. Weight 0.5 oz. Sometimes called Inca rose, rhodochrosite features a milky matrix in a soft rose color and has a lustrous shimmering finish. The milky inclusions vary, making each stone unique.